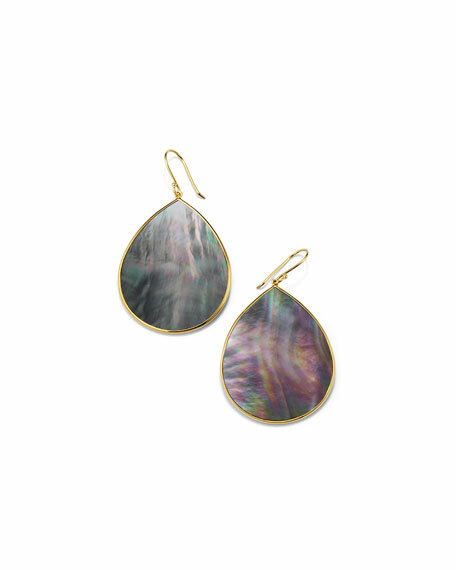 Ippolita teardrop earrings from the Polished Rock Candy Collection. Polished 18-karat yellow gold French wire and hardware. Slice teardrops in bezel settings. Alexis Bittar crystal framed cushion earrings. Blackened gunmetal-tone plating over brass. Prong-set, cushion-cut white cubic zirconia. Crystal pav?? hoops and cushion frame. Lever backs for pierced ears. Approx. 1.4"L drop. Alexis Bittar retro clip-on earrings. Golden and rhodium-tone plating. Hand-sculpted, hand-painted Lucite??. Crystal with natural malachite doublets. Clear crystal accents detail stones. Approx. 2.8"L; 0.8"W. Clip-on backs. Made in USA.